Gene is a shy tuexedo cat that enjoys geeky games and playing with his friends. Gene is a very shy kitty. He likes to meet new friends, but can be slow to open up to new furs. But if you're his friend he likes to act mischievously and play around like he's up to something. Gene likes generally nerdy and geeky things. He enjoys reading fantasy novels, playing RPGs and other fantasy themed video games, and loves playing D&D (even if he isn't very good at it). His favorite food is grilled or roasted fish and loves trying new flavors of juices. In his older years, Gene is a college student looking to work with computers. In the fantasy worlds, he is a entertainer who is proficient at tumbling, storytelling, and music. He found a wizard's spellbook and is learning how to become one himself. So far he is starting learning the Illusion school of magic and can only cast small illusions. Although he doesn't have any siblings related by blood, he considers his best friend, Zing the bat, to be a sister to him. Same as our world but populated by furries. Also can be in a fantasy world like most fantasy RPGs with magic and monsters and such. 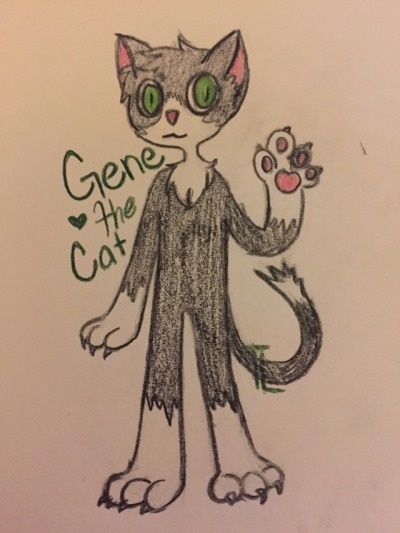 Gene is a tuexdo cat with black fur all over his body except for his hand and feet paws, tip of his tail, and his face and neck areas. He has green eyes and pink paw pads. He is about 5'7" and 160 lbs. Typically wears comfortable clothes like sweatpants and hoodies in the colder months. He wears shorts and t-shirts throughout most of the summer. Likes boxers or boxer briefs. Sometimes wears a little watch/pedometer device on his left wrist. Has a green collar with a bell on it for when he's at home so he doesn't scare Zing by sneaking up on her. This is a temporary reference sheet for my sona, Gene. I plan on updating this at a later point when my friend finishes the digital ref sheet that she is working on. Drawn by the amazing @thetimelard on tumblr!